Cancer Council volunteers Supreet Sandhu, Maureen Wan, Julie Land and Tracy Tran manned the cake stall. 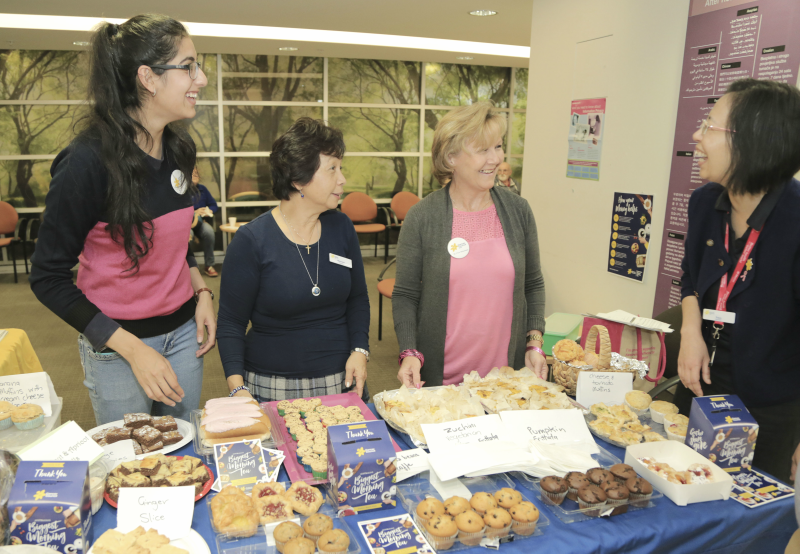 Staff and patients from Westmead’s Crown Princess Mary Cancer Centre (CPMCC) shared stories over a cup of tea and a cake on May 18, to raise money in support of the Cancer Council’s Biggest Morning Tea. Cancer council volunteers Susie Namayakkara and Elenora Bergmaschini with Westmead Hospital cancer nurse Matthew Ellis and radiation therapy deputy director Allana Macertich. Dozens of patients handed over a gold coin and enjoyed a sweet treat, with every dollar raised going towards funding the Cancer Council’s research, prevention and support service programs. Congratulations to the CPMCC team who raised $1150. Staff and patients enjoyed the Biggest Morning Tea. Dedicated Cancer Council volunteers are available daily at the CPMCC, as well as in Blacktown’s Oncology and Haematology Centre. Volunteers provide much-needed help and support to cancer patients and their families.